The Animal Support Project » ASPCA Grant Enables TASP Volunteers to Attend Training in Nashville. ASPCA Grant Enables TASP Volunteers to Attend Training in Nashville. In early May, a generous stipend from ASPCA® (American Society for the Prevention of Cruelty to Animals®) helped TASP send two volunteers, Donna Farnsworth and Debbie D’Angelo, to four days of intensive training and networking sessions at the annual Humane Society of the United States Animal Care Expo. In addition to meeting with experts from all the major national animal welfare organizations including ASPCA, HSUS, RedRover and PetSmart Charities, Debbie and Donna attended seminars on fundraising, sheltering, and the latest veterinary and spay/neuter approaches. They visited the Expo Trade Fair, where they sampled all the latest technologies and products offered to animal welfare workers, and on their own dime, they purchased and donated to TASP, a complete video copy of the entire event’s seminars. Because of their efforts, all of our volunteers can now share in the information from Animal Care Expo. On opening day of the event, Debbie and Donna attended a day-long session on keeping pets with their owners through outreach. 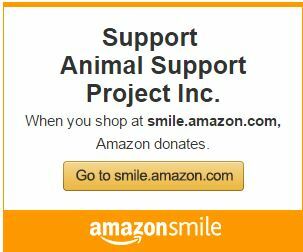 This topic is the foundation of The Animal Support Project’s mission and we are so proud to know the national groups are recognizing the value of that approach! Having the ASPCA and TASP assist with the cost of sending these two wonderful ladies to this year’s Animal Care Expo enables us to remain on track with our approach to serving our community with all the latest techniques and technology as we perform our mission, without cutting into our direct-care budget of funds used for our daily operations. We are proud and so grateful to receive ASPCA’s assistance!